Whether you’re a student preparing for exams or an employee bettering their career with a little continuing education, studying is an essential part of it. Unfortunately, not all of us are cut out for the long hours and stress that comes with it, not to mention the sheer volume of information you are required to know. Enter the best nootropic stacks for studying. Nootropics are a great way to give your brain the extra energy, focus and memory needed to help you pull through with your studies. When paired together correctly, the right nootropic stack can give you the edge you need to succeed. There are a ton of products on the market, but which are the best nootropics for students? We’re breaking down our 3 best nootropic stacks for studying based on your study needs, so read on and let’s dive into it. Studying requires a certain amount of memorization and there are many nootropics that specifically work to improve your how your brain makes new memories and enhances your memory recall. If memory enhancement is your goal, then you want to be using a nootropic that targets your neural plasticity; the function that allows your brain cells and neurons to form new connections. As your neural plasticity improves you will notice that your ability to learn, retain and recall information becomes significantly better. It’s worth noting that while many of these nootropics work great individually, a well devised stack can give you even better results. Below is an outline of a nootropic stack for studying that will enhance your memory. Also known as Olmifon, Adrafinil is a water soluble nootropic that improves your memory by stimulating your glutamate receptors. These receptors are responsible for synapse in your brain. The better your synapse, the higher your memory performance will be. Many users have found that an added benefit of Adrafinil is its ability to improve wakefulness without causing any jittery side effects. The recommended daily dose of Adrafinil is 150-300 mg. It is typically sold as a powder, but can also come in capsule form. Another cognitive enhancing nootropic, Noopept works by honing your reasoning skills. It is considered a mild psychostimulant and anxiolytic, meaning it boosts your focus while reducing the level of stress or anxiety you may be experience as a result of studying. As far as nootropic stacks for studying goes, Noopept is a must have when it comes to memory enhancement. The daily dose of Noopept is relatively low. You should not take more than 10-30 mg per day or you might experience headaches or brain fog. The primary function of this stack is to increase acetylcholine, the neurotransmitter critical to the formation of memories and learning capacities. As a whole, it provides you with an unbeatable brain boosting combination for more effective study sessions. The recommended dosage of Alpha Brain is 2 capsules daily, taken in the morning or early afternoon for best results. It is best to take Alpha Brain with food as it is fat soluble and will work better and faster when taken with a light meal. Do not take more than 3 capsules in a 24-hour period. There is no substitute for getting a good night’s sleep, eating healthy and exercising. Living an all around healthy lifestyle will naturally provide you with the focus, energy and the ability to learn that you need when it comes to studying. But for those times when you simply aren’t getting enough rest, can’t channel an ounce of focus or need a little more concentration, we’ve got a nootropric stack for that. When it comes to nootropic stacks for studying, l-theanine is a must-have. This powerful nootropic helps put your body and mind in a more relaxed state so you can focus on the task at hand. It’s almost like being in a meditative state of concentration. It also happens to be perfect for catching a few more zzz’s when you take it right before bedtime. The recommended daily dose for l-theanine is 100-200 mg. It is always best to start at a lower dosage and work your way up from there to see how your body reacts. Some users have found that when paired with caffeine, they will use between 300-400 mg of L-theanine. Again, we recommend starting at the lowest dosage and adjusting over time. To get the most focus and concentration out of this nootropic stack for studying, you’re going to want to pair your l-theanine with a dose of caffeine. Caffeine is one of the most common energy boosting tools we use on a daily basis (espresso, anyone!) and is not technically a nootropic because it is a stimulant. That being said, there is plenty of scientific research proving its ability to improve mental performance and cognitive functioning. When paired with l-theanine, caffeine helps round out the benefits of L-theanine by reducing any sleepy side effects. It also doesn’t give you the jittery side effects of just taking caffeine on its own. The recommended daily dose of caffeine is between 100-200 mg for adults. Many of us have built up a tolerance to its effects with regular coffee consumption, and may be tempted to increase that dosage. For the purposes of using this stack for studying, studies have found that the best ratio of caffeine to l-theanine is 1 part caffeine to 2 parts l-theanine. For example, 100 mg caffeine and 200 mg l-theanine. Ciltep is designed to help turn short term memories into long term memories (also referred to as long term potentiation), while improving focus and concentration. It’s two key ingredients include premium artichoke extract and forskolin. Artichoke extract is a natural PDE4 inhibitor which has been found to increase not only your cognition, but wakefulness. Forskolin on the other hand, activates an enzyme that increases intracellular levels of cAMP leading to improved memory formation and information retention. The recommended dose of Cilep is 2-3 capsules on an empty stomach. It is best taken in the morning before eating, and you should not take more than 3 capsules daily. It is also recommended that you do not take it more than 5-6 times per week. A 1-2 day break each week is ideal. Stress and anxiety is a natural side effect of studying, especially when you’re cramming for a big exam or project. The side effects of stress and anxiety can be some of the most ovewhelming and have highly negative impacts on your study efforts. If you’re looking for a nootropic stack for studying that will combat your woes, then here’s the one for you. Phenibut is a natural derivative of GABA and is incredibly effective at passing through the blood-brain barrier for fast results. This nootropic is effective at relieving short term stress and anxiety, but should not be considered a long term solution as it is incredibly powerful. The recommended dosage of Phenibut is 250-1000 mg daily, though studies have shown that as much as 3000 mg of Phenibut daily can be safe. For the purposes of this study stack, do not exceed 1000 mg per day. Aniracetam is one of the best nootroprics for combatting stress because it does so much more than put you in a relaxed state. It helps to boost your mood, increase energy, focus and motivation for heightened memory and clear thinking. It does this by stimulating AMPA receptors that regulate your body’s level of glutamate, and essentially your GABA levels. The recommended dose of aniracetam for studying is 500-750 mg taken twice daily (for a total of 1000-1500mg per day). This can be taken in powder or capsule form and still have highly effective results. By combining phenibut and aniracetam you get the anti-anxiety effects that you need to focus with a clear mind, and the mood enhancing effects that breed optimism while you cram for that exam. New Mood combines several deeply relaxing herbs that work to not only reduce stress and improve your mood, but that pass the blood-brain barrier quickly for fast results. New Mood can be used as a sleep aid or on a daily basis for reducing anxiety and stress. As a nootropic stack for studying, we recommend taking 2 capsules of New Mood through out the day when studying. Do not exceed 6 capsules in one day. There are so many powerful and effective nootropics available, and the stacking options are innumerable. The most basic approach is to start small (in both dosage and quantity of nootropics you intend on stacking together) and adjust over time so you know how it affects your mind and body. Nootropics require a little bit of trial and error, but we have found that the above nootropic stacks for studying are the most effective when tackling specific areas of need. 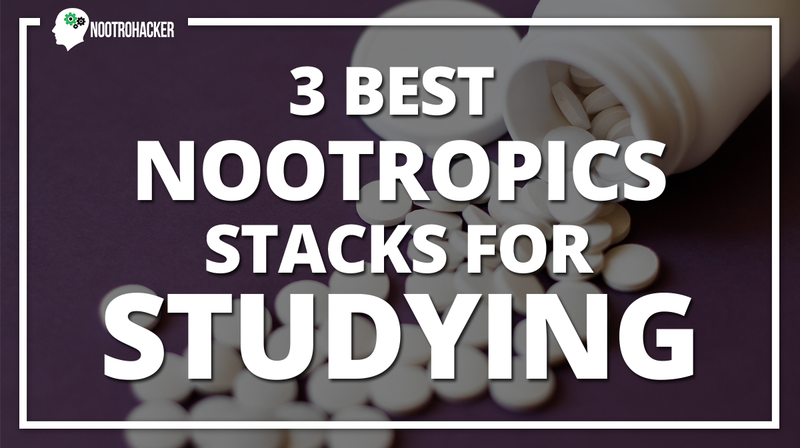 Tell us — do you have a favourite nootropic stack that you use when cramming for an exam? Share your stack ideas in the comment section below.